A Zoo Pop Up for my new Grand Nephew! May 3, 2016 August 28, 2016 Kathleen Adams2 Comments on A Zoo Pop Up for my new Grand Nephew! Our family is so lucky to have a new baby boy addition to our family. My niece just had her first child, John William after his grandpa! I was asked a while ago from a fellow poster on the Elizabeth Craft Designs Facebook Family page to create a tutorial for how I make these little scene pop up cards. Shamefully, it was several months ago that I promised her I would do one. This however, really is the first one since I made that promise. I wanted to wait until I made a new one so I could photograph all the steps. Warning: This is a long blog entry. So if you’re not interested in the “how to’s” for this card you need not read on. For those that do want to know all the steps……well here goes. Grab a beverage, get comfy and read on. I first took an 8.5″ x 11″ piece of white cardstock and scored on the 11″ side at 5.5″. That left me with a folded card that measured 5.5″ x 8.5″ I trimmed the folded card to 5.5″ x 5 7/8″. Hint: Save what you trimmed off. After choosing the papers I would use for the sky and the grass, I cut a piece of each paper 5.5″ x 5 7/8″. I then put each of these two papers with temporary adhesive onto the white cardstock as in the picture. I then centered the die as also shown in the above picture on the fold line. 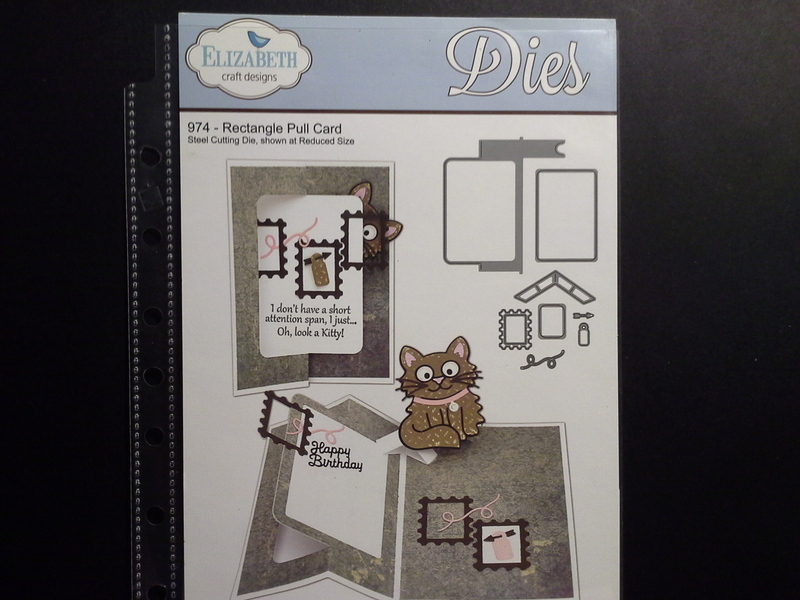 This die is from the Elizabeth Craft die set called “Lots of Pops”. 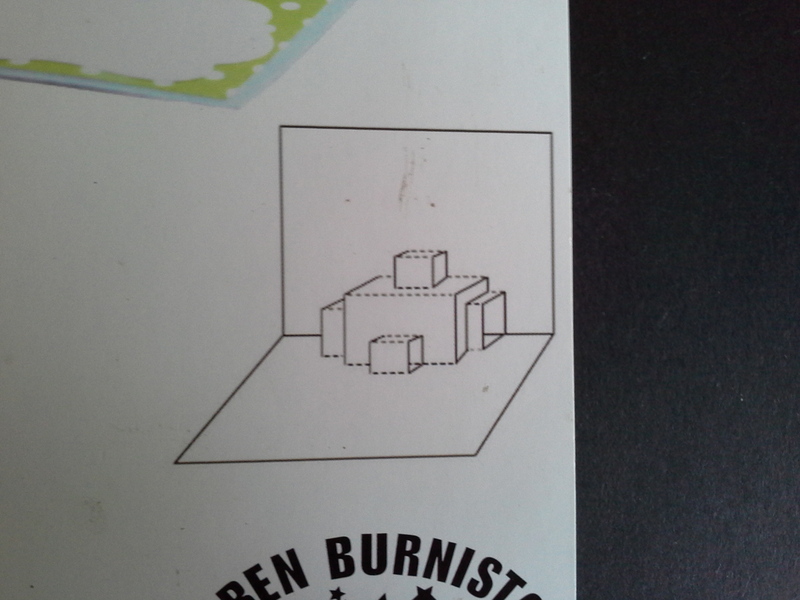 On the lower right hand corner of the above, right over the designer Karen Burniston’s logo, you can see a diagram of all the pop out opportunities this little die creates. Run the sandwiched cardstock, paper and die through your die cutting machine. At this point I only popped out the large center and the little center pop in front. Because I didn’t know yet how many of the pops I would need. I like to leave them not popped out. The reason is if I don’t need the two side pops, they look better left alone. As it turned out I only used the right side pop. I know this sounds confusing, but look at the diagram again on the package and you will see the little side pops I’m referring to. I knew I wanted to make a zoo theme because I made a bunch of receiving blankets and stuff with this cotton flannel fabric. I found some adorable zoo animals in the Silhouette library that were print and cut. So to save time I chose those. Elizabeth Craft Designs has a lot of little adorable critter dies that I am starting to collect but didn’t want to have to do all that cutting and putting together as I knew I would be assembling enough things already…..and I also needed to get this package in the mail before my grandnephew was ready for school! Below is a picture of my assembled tree with the hanging money on a branch attached to the tree. This is where things can go all wrong. In step 1 I gave you a hint to save the trimmed pieces from your card base. Now is where you’ll want them. The above shows the white cardstock trimmed from the card base and some of the designer paper I chose for the grass. Your white cardstock strip should have the same score line as your base card because you trimmed it from your scored and folded card. 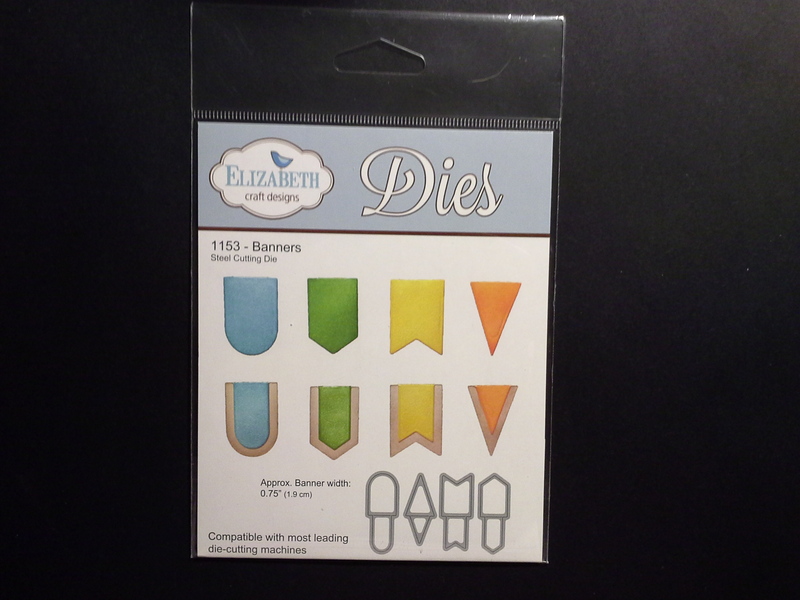 You now can glue or use adhesive tape as I did (Elizabeth Craft Designs double sided adhesive) on one half of that white cardstock strip and fold the other half over. You now have a very sturdy strip of white cardstock that is the exact width of your card.. I then glued my green paper to this strip. The next thing I do, and believe me, it will save you irreversible errors if you do this. I audition all my pieces or elements to my scene before anything gets glued in place. The above picture shows where I auditions elements. Even the tree was auditioned before I adhered it to the back of the scene. I found the tree was too tall with all the foliage. So I trimmed the bottom of the tree and didn’t use the little top pop. (again refer to the sketch on the package). Do you see where I slid the strip I had you make. At this point, I have it through the front pop and leaning against the larger one it’s cut from. Now you see that all those little pops can be as wide as you want them because the basic structure is all ready there for you. I keep an old ash tray that was my Dad’s favorite on my coffee table with glass aquarium stones in it. They make great aids in keeping the elements I’m auditioning from falling over as I figure out where I want them. In this 1st audition, the giraffe is in the same row as the tiger and elephant. I decided in this step that I wanted him in the pop behind this layer. More about this later. This above picture shows some other elements I cut. I cut two of a fence from a Memory Box die called “Estate Fence”. I needed that fence to be sturdy. I glued one on top of the other. I also cut two of the poles from the “Lots of Pops” die set in the same pale grey cardstock, that was a piece in my stash, as the fence. 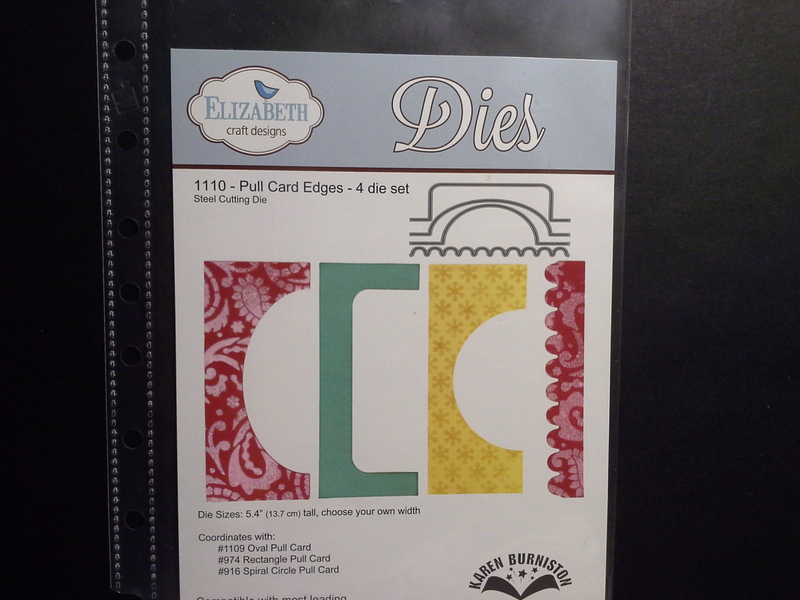 You also see I cut one banner from the Elizabeth Craft Designs “Banners” die set. I hand printed ZOO and used the little arrow die from the Elizabeth Craft Designs “Rectangle Pull Card” die set on the banner. Once I liked where each of the animals would go I now needed to work on the last layer. Still nothing but the tree has been glued in place. The last, or furthest forward, layer would be a fence with the zoo banner. The left photo shows how I lined up the pole with the rungs on the fence and glued it. Then put the second pole over this sandwiching the fence between them. I then made another strip of cardstock and paper but then ran it through the die cutter using the scalloped edge die in Elizabeth Craft Die set “Pull Card Edges”. The third picture shows I also cut another strip of just one layer of cardstock and ran it through the die cutter with the same scallop edge to further strengthen this last layer because I found a couple of more things for my scene. I then trimmed the extra white off with my paper cutter. Once I was happy with the fence layer I knew I could glue the other layers in place. The above picture shows just that. You can’t see well but I cut the strip that I auditioned the tiger and elephant in half and put the two on either side of the last pop. The other half I glued the giraffe to and added some grass (also from The All Seasons Tree set). That strip was glued to the right pop behind the elephant. I added a cloud to the back by computer generating the sentiment “Welcome little John W.” then cutting it out with the larger of the cloud/tree foliage die in the “All Seasons Tree” die set. The picture on the right shows the fence put together. It needed something on the other end and I was just going to cut two more poles but then I saw the little girl zoo keeper in the Silhouette library and thought she had to be there. I also found a Zebra and added him to the left back. It needed something too. The above was the 3rd and last audition. I leaned the fence layer against the little foremost to the front pop to see if I indeed did like the little zoo keeper and started to play with how I would add another sentiment. I computer generated “We’ve been waiting a long time to meet you” then cut it out with an oval die. I used a PanPastel blue to color the edges and added 3 more die cut clouds from The All Seasons Tree. The Brads (frog & plant) is from The Eyelet Outlet. I love that company. They make brads in soooo many shapes. Check them out. The above three photos show I actually only have used three of the pop opportunities. In other little scene pop up cards I used every possible place to add elements to the scene. This is just a little closer look at the little pond sentiment. At this point your inside is finished but you need to create an outside card to put this scene into. I learned from the famous Karen Burniston that a fold glued into a fold NEVER works out well. Oh boy did I learn that the hard way. You spend all this time on your pop up scene and the card doesn’t open and close just right. So what do you do. You make two pieces. One is the front of the card and the other is the back of the card. The Front of my new Grand nephew’s card. 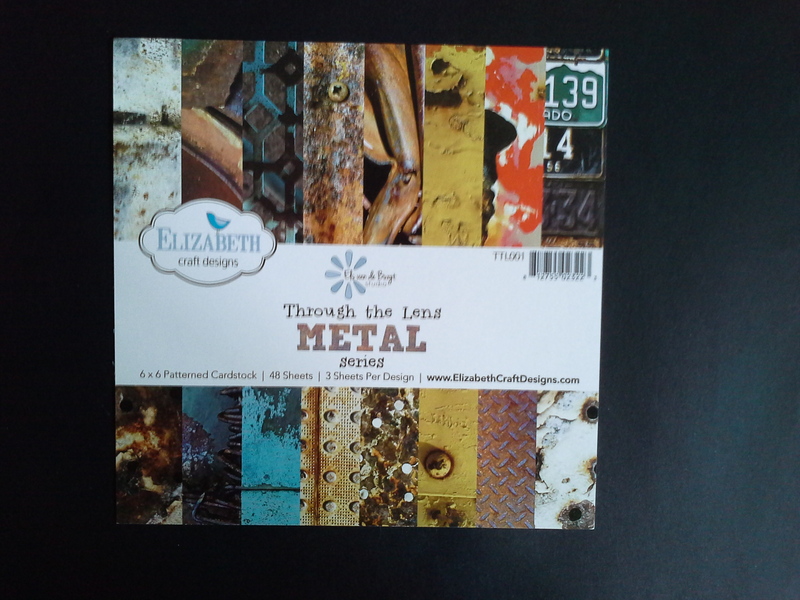 Els Van de Burgt, the owner of Elizabeth Craft Designs, created cardstock out of photos she had taken. There are three sets: Wood, Metal, and Stone. I used one in the Metal series which was a picture of Colorado license plates. That is where my niece and 3 sisters live so of course I had to use it for this card front. I wanted as many of the license plates that said “Colorado” to show so that is why I put the other two elements (the gold from the same stack and the cute Zoo Patrol jeep in the lower left hand corner. The jeep is also a Silhouette file. I made a sentiment with my computer and used an oval die to cut it out. Then I tucked it behind the fender of the jeep with a little craft glue. The jeep is popped up with foam dots. The last step, (yay, I know your saying) is to adhere your front and back to the pop up. I used Elizabeth Craft Designs double sided adhesive (10mm) to do this step. Caution: Don’t put any adhesive where the pops are. That would be disastrous. That’s it! Well, I’m exhausted and I know you are too from all this reading. I thank you for hanging in there and really do hope you will give this a try. I’m thinking of making a slide show of some of the other pop up scene cards I made using these techniques. GREAT card and FABULOUS step-by-step tutorial that was easy to follow and very entertaining. You had me giggling with some of your comments. EEEEEEK — this is SOOOOO cute.